When a movie is set in South Carolina and involves a racial theme, I get my dukes up. I grew up in Charleston, and I’m well aware of sad history, but I’ve seen too many stories in which every character with a Southern accent is turned into a cloven-hoofed monster, for the sake of dramatic tension. My dukes got mighty tired during the course of ‘Radio,’ as almost every character with a Southern accent treated Cuba Gooding’s character with respect, affection, even big bear hugs. This lovely story of a rural upstate town, Anderson, taking a mentally-challenged young man to its capacious bosom was inspiring but hardly gripping. The first rule of drama is that there must be conflict, and conflict was scant on the ground in every scene that did not involve colliding football players. A couple of times teammates (of both races) act belligerently toward him, trying to frighten him or trick him into getting in trouble, but this antagonism is short-lived. Even when Radio becomes a liability to the team, shouting out overheard plays loud enough for the opposition to hear, he is swiftly forgiven and awarded the game ball. The next thing we see is the entire town gathering on Christmas Eve to load Radio up with presents. Everywhere he goes, people love him. Like the story in the Gospels of the paralyzed man let down through the roof by his friends, this is a story about heroic acts of friendship. The real star of the show is the population of Anderson, which instinctively reached out with such warmth to a man with so little to give. The film doesn’t flinch on that note; Radio never does contribute very much. A pleasant young man, he is gratified by attention and blooms into someone confident that he deserves to be cherished wherever he goes. Childlike narcissism is protected and indulged, out of love readily bestowed by the entire city. For a film trying hard to reach a Christian audience, it treats faith with long-handled tongs. The single least believable moment is when Radio’s mother dies, and Coach Jones tries to comfort him without reference to Jesus, heaven, or any other element of rich Southern spirituality shared by black and white alike. ‘Where’s my momma” Radio wails, and Coach Jones assures him, ‘She will always be with you, inside, in your heart.’ BRRAP! Wrong answer! So after simmering in mild annoyance and impatience for two hours I was completely unprepared for the impact of the film’s last minutes. 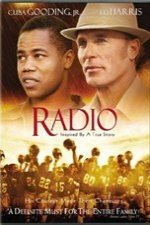 After a title reading ‘26 Years Later’ we see the real-life Radio burst onto the Hanna High field ahead of the team. He is in his mid-fifties now, and still enjoying the town ‘s love. The real Coach Jones is seen receiving an award, and hugging Radio; their friendship has endured all these years. The sight of these real faces, not movie-star faces but ordinary faces of real people who have suffered and struggled, was startling and moving. This movie should have been a documentary. There is a great story here somewhere, but unfortunately, ‘Radio’ doesn’t tell it.